The device has an invisible nano-coating layer that makes it spill & splash free. The speakers of this phone use Dolby Atmos technology that allows sound to move in three-dimensional space, not just in channels. Thus giving the sound experience an amazing clarity, richness, power, and depth. Battery Built-in 3050 mAh battery that supports 5V/2A rapid charge. 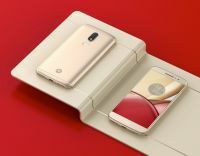 To Recieve updates and possible rewards for Motorola Moto M (Gold 32GB) please sign in. To Recieve updates and possible rewards for Mobile & Smartphone please sign in.